Beginning with the first sin of Adam and Eve (Genesis 3), God has been calling for humanity to repent of their sins. Repentance was the message that the prophets of old preached to the world (Isaiah 55:7; Jeremiah 8:6; Ezra 14:6; Hosea 11:5; Amos 5:4-6; John 3:2-10). Men like Isaiah called for “the wicked [man] to forsake his way, and the unrighteous man his thoughts; and let him return to the Lord.” As God moved toward the age of the New Covenant His message of repentance did not change. John the Baptizer, the lone voice in the wilderness, cried out, “Repent, for the kingdom of God is at hand.” (Matthew 3:2) When Jesus went from village to village preaching the Good News, His message was, “Repent, and believe in the gospel” (Mark 1:15). And when the Savior dispatched his chosen disciples to preach the Kingdom of God, He instructed them to preach “repentance and remission of sins” (Luke 24:47). And this they did, beginning on the day of Pentecost, Peter and the other apostles called for all people to “Repent and be baptized for the remission of sins.” (Acts 2:38). And through the work of the apostles, God’s message of repentance spread through the world. Not only that, but it has spanned the ages so that we today know God’s will toward us. With God placing such a heavy emphasis on the necessity of repentance would we not do well to learn what the Bible says true repentance? Would it not be in our best interest to understand the principles of repentance? Because if we are to be well pleasing toward God then we must know what He expects of us when we repent. Let’s first start by asking the question… What does it mean to repent? Often times the way we answer that question is by simply saying, “Well it means to change your ways.” That’s an okay answer but it is lacking because it does not capture the full essence of how the bible characterizes true repentance. Yes, repentance is change but so much more than merely changing one’s ways. True repentance first involves changing one’s emotions, then one’s mind, and finally changing one’s actions. This is how repentance is described in the New Testament. In fact, the New Testament writers used three different Greek words to describe how one repents. 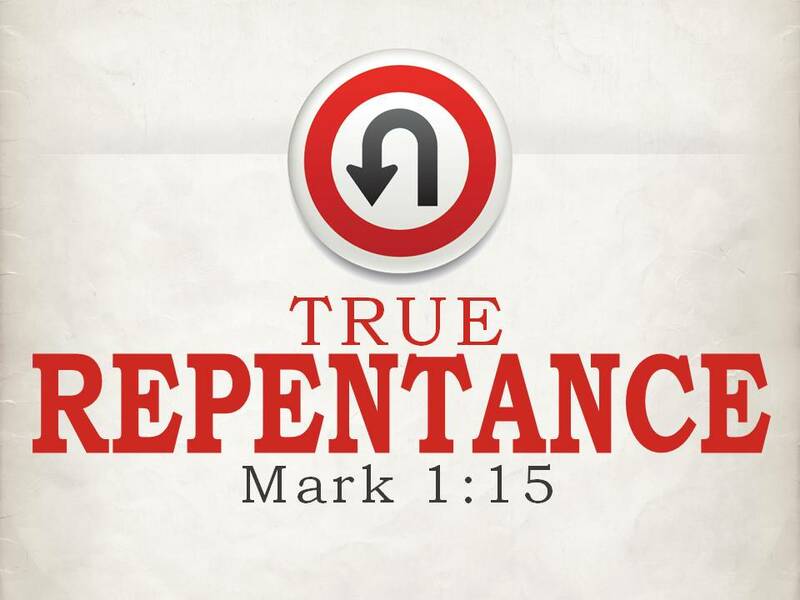 It’s these three words that shape the foundation of true repentance and will also form the basis of our less. Jesus uses this word in the parable of the Two Sons (Matthew 21:28-32) in describing the son who at first said he would not go work in his father’s vineyard but later “But afterward he regretted it and went” (Matthew 21:29) and again in Matthew 21:32. We see that the son felt sorry for not doing what his father commanded him to do. It was this sorrow that lead him to change his mind, then his actions. The apostle Paul also uses this word when he explains the principle of True Repentance is a change in Emotions, in his second letter to the Corinthians (2 Corinthians 7:8-10). Note that he says, “Now I rejoice not that you were made sorry, but that your sorrow led to repentance. For godly sorrow produces repentance leading to salvation.” (2 Corinthians 7:9, 10) Remember the state of the Corinthians in Paul’s first letter? They were “puffed up” with pride over the acceptance of a man who had his father’s wife (1 Corinthians 5:2). Because of Paul’s rebuke the congregation had changed their emotions toward their own sins and the sins of the adulterer and their mourning let to their repentance. We live in a time when people want to medicate and sooth their sorrow. But as God’s children, we must recognize that if we have sinned and are in need of repentance, then God wants us to mourn and weep over our sins (Luke 6:21). He wants sorrow to enter our lives because we are suffering the consequences of what we have done. Only when we change our emotions, from joy and acceptance to sorrow and rejection, toward our sins can we begin to experience True Repentance. But there’s more than being sorry for what we have done, our sorrow must lead to a change of mind. True Repentance is a change of Mind: The second principle in understanding True Repentance is to understand that we must not only change our emotions but we must also change our minds. Jesus and the New Testament writers used the Greek word metanoéō (G3340) to describe this type of repentance. This is the general word translated repent (and its different tenses) and it literally means to think differently. The reason God is longsuffering with us, is because He wants us to change our minds, to think differently, He wants us to repent (2 Peter 3:9). Luke 5:32 – Jesus did not come to “call the righteous but sinners to repentance.” The sinner is the one in need of a changing of the mind, turning their thoughts away from sin to God. Luke 13:1-5 – The Galileans needed to change their thinking about those who died being worse than themselves. In the parable of The Rich Man and Lazarus (Luke 16:19-31), the Rich Man tells Abraham that his brothers would not “repent” (change their minds) unless one went back from the dead (Luke 16:30). Change their minds toward God, or change their minds toward riches, or change their minds about righteousness, or perhaps about the afterlife. But when Jesus came preaching repentance He wanted people to change their minds, He wanted them to repent. Perhaps the principle that True Repentance means a change of mind can best be seen in the church at Corinth. Notice what is said in 2 Corinthians 7:9-10: First they changed their emotions. They went from puffed up to sorrow. Their sorrow was godly sorrows that lead to repentance; that lead to a change of mind. Second they changed their minds. This is seen in the use of the word metanoéō in 2 Corinthians 7:9-10. No longer did they think that it was acceptable to allow the man who had his father’s wife fellowship with the church. By being mindful of the things of God (Matthew 16:23). Let’s care for the things that God cares for. By setting our minds on the things above (Colossians 3:2). Let’s be people who have a mind that has a love for heavenly things. By being spiritually minded which leads to life (Romans 8:6). Because if we are spiritually minded then we will have life. Once we come to Christ. Once we repent of our sins, we can’t be the same old person anymore. We have to change the way we think. True Repentance is a change in Actions: The third and final principle in understanding True Repentance is to understand that we must not only change our emotions, and our minds but we must also change our actions. The New Testament writers used the Greek word epistréphō (G1994) to describe this type of repentance. This is the word that is generally translated convert or turn. When the saints were scattered from Jerusalem “the hand of the Lord was with them and a great number of people believed and turned to the Lord” in Antioch (Acts 11:21). A change in emotions (Luke 15:18-19). He’s gone from brash and prideful to humble and penitent. A change of mind (Luke 15:17). He came to himself. A change of action (Luke 15:18-20). He went back to his father. No longer was he trying to go away from his father he changed and went back home. God is calling for us to come to Him in True Repentance. If we would be received by Him then we must change our emotions, our minds and our actions and then we will be forgiven. [i] Metamélomai is also the word used in Matthew 27:3 to describe Judas’ “remorse” that he felt after betraying Jesus. Even though we may repent with our emotions we must also repent with our will and actions in order to have True Repentance. ← Are You A Juice Box Christian?